Having already taken the Tour of Oman this season, Chris Froome (Sky) underlined his strong early-season form again today in Tirreno Adriatico today when he took a strong mountain victory at Prati di Tivo. The British rider bided his time while rivals Alberto Contador (Team Saxo Tinkoff), Vincenzo Nibali (Astana) and Mauro Santambrogio (Vini Fantini) attacked on the final climb, letting his team-mate Rigoberto Uran bring him back up with one kilometre to go, then launching an attack that nobody could answer. “I’m really happy with that victory, it was a really good day for us,” he said. “I only ended up doing a kilometre in the wind myself. It really was an armchair ride. To have the guys there who were with me on the climb – Rigo, Sergio and Dario – to have them pulling for me when guys like Nibali and Contador are attacking is a really good feeling. The jump saw him finish six seconds clear of Mauro Santambrogio (Vini Fantini) and eleven ahead of Nibali, while Omega Pharma Quick Step’s Michal Kwiatkowski rode strongly to take fourth, thirteen seconds back. The Pole finished two seconds ahead of Chris Horner (RadioShack Leopard) and Contador and, crucially, did enough to succeed his team-mate Mark Cavendish as the overall leader of the race. Kwiatkowski ends the day four seconds ahead of Froome, sixteen clear of Nibali and exactly half a minute up on Contador. Other contenders such as Joaquim Rodriguez (Katusha) and Cadel Evans (BMC Racing Team) weren’t at their best today and conceded time, likely losing their chance of winning the race. Three more stages remain and Kwiatkowski is certain to come under attack. The former world junior TT champion rode well today, though, and his performance locks him into the blue jersey for now, heading the Race of the Two Seas. Taking in three climbs, the fourth stage of Tirreno-Adriatico would represent the first major shake up of the general classification since the opening team time trial. Two days of sprint stages were followed today by a tough 165 kilometre race taking in the Forca di Arrone, Passo Capannelle and Prati di Tivo ascents, and race leader Mark Cavendish knew with certainty that it would be game over for his blue jersey. After leaving Narni, the peloton rode aggressively with many riders trying to get clear. The elastic finally snapped after approximately twenty kilometres, when Fredrik Kessiakoff (Astana), Anthony Roux (FDJ), Tomasz Marczynski (Vacansoleil) and Francesco Failli (Vini Fantini) clipped away and rapidly opened a lead. Failli took the prime atop the Forca di Arrone (km 31.3), edging out Roux, Kessiakoff and Marczynski. The peloton was already four and a half minutes back by kilometre 35, and this gap grew to seven minutes over the next twenty kilometres. The Omega Pharma Quick Step team of Cavendish were doing the early pace-setting, and were content to allow the break some space. Roux took the sprint at Rocca di Corno (km 90.5), crossing the prime line ahead of Kessiakoff, Failli and Marczynski. The break continued on and held a gap of just under five minutes with fifty kilometres left. The Omega Pharma Quick Step team picked up the pace, and over the next seventeen kilometres further reduced the break’s advantage to under two minutes. Working for Cadel Evans, the BMC Racing Team took over the pacemaking and drove the peloton on to the day’s final climb, the Prati di Tivo. There Chris Froome’s Team Sky moved to the front and further ramped up the speed, prompting Marczynski to leave the other three riders behind and to try to stay clear. The lone leader had just 43 seconds with nine kilometres to go and was caught soon afterwards. Sky continued to turn the screw and the pace put Cadel Evans (BMC Racing Team), Joaquim Rodriguez (Katusha) and Mauro Santambrogio (Vini Fantini) out the back. With approximately seven kilometres to go Roman Kreuziger (Team Saxo Tinkoff) also got into trouble and cracked. His team-mate Alberto Contador was feeling considerably better than the Czech rider and with just over six kilometres left to the summit, he rose out of the saddle, kicked hard and opened a gap. Pounding the pedals around, his acceleration caused the leading group to reduce further, but the Team Sky train was able to get back up to him relatively quickly and resumed its pace-setting at the head of the peloton. The Evans/Rodriguez group continued to fight to get back on terms. Rodriguez and Santambrogio eventually managed to return, but with 3.7 kilometres remaining, Evans cracked and slipped right back. Sergio Henao and Rigoberto Uran were leading their team leader Chris Froome, who in turn was trailed by Chris Horner (RadioShack Leopard), Contador, Vincenzo Nibali (Astana) and several others. With the top getting closer, it was a question of when, and not if, the attacks for the stage win would fire off. Contador was the aggressor once again, leaping clear with 2.7 kilometres remaining and again opening a gap. Uran and Henao chased hard but couldn’t peg him back this time, although the gap remained relatively modest. Nibali was feeling good and jumped across the gap with 1.9 kilometres remaining, while Santambrogio was firmly latched onto his wheel and made it three out front. The Astana captain went by Contador, who was able to grab his wheel, then continued to push the pace. That committed driving only lasted so long, then Nibali started to look back and seek for the other two to come through. Contador was still recovering, though, and Santambrogio was content to sit on. Neither were prepared to take over at that point. Going under the kite for the final kilometre, the small loss of momentum meant that the two groups were coming back together. Nibali looked back, saw the junction was about to be made and surged hard. 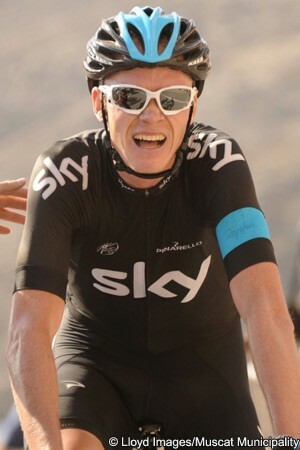 Froome had initially not attempted to go with any of the jumps on the climb, but sprung into action, jumping across with Horner en tow and then immediately attacking. His surge carried him clear and while first Horner and then Nibali tried to reel him in, he would not be denied. The 2012 Tour de France runner-up hit the line first, while Santambrogio was strongest of the rest inside the final five hundred metres and picked up second place, six seconds back. Nibali was next, while Kwiatkowski rode above expectations to place fourth, just thirteen seconds back. That performance was enough to hand him the blue race leader’s jersey, with his accumulated time putting him four seconds ahead of Froome. Nibali, Contador, Uran, Horner and Santambrogio ended the day next in line, with their deficit ranging from sixteen seconds to forty, and ensuring that the remaining three stages will be eventful. Tirreno Adriatico continues tomorrow with another mountainous stage, a 230 kilometre race from Ortona to Chieti which includes two big peaks plus a short, steep uphill finish. The tight gaps at the top mean that the battle will continue there, and that Kwiatkowski will once again have to rise to the challenge.